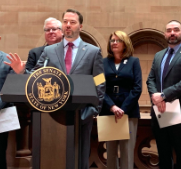 With New York’s budget due April 1 and funding needs remaining, as well as Amazon’s much-publicized exit from New York, Ortt and his colleagues said the time was right for the tax credit’s elimination. The senators featured a sign and provided handouts showing the dramatic shift leading Democrats have taken on the issue. Cuomo, who has supported and expanded the program since taking office, recently suggested the credit be eliminated to fund other priorities. Democratic Sen. and Finance Chairwoman Liz Kruger has repeatedly questioned the need for the film tax credit and suggested it was too generous. But last week, she heralded the credits’ success and stated the Senate would not end the credit.